Since the age of nine, I have been fascinated with briyani, an Indian rice dish popular with all races. Who doesn’t love a good briyani? I still remember the unforgetteable day vividly when I was a child. I used to be fast asleep, but rudely awakened in the wee hours of the morning by my mother. As soon as I woke up, I had a whiff of the most heavenly smell. The smell was wafting from a packet of briyani that my father had brought home after a Tamil New Year party in his office. I felt that it was a dream as I least expected to be woken up to eat briyani. The briyani was packed in Opeh leaf which emitted a woody fragrance. The smell of the cucumber achar, an accompaniment with the rice, is something I still carry in my memory. That briyani from Jubilee restaurant along North Bridge Road (the restaurant is not existing anymore) was luxuriously tinged with saffron strands, drops of rose water and a large cut of tender, moist bone-in mutton that was not spicy, yet sublime. 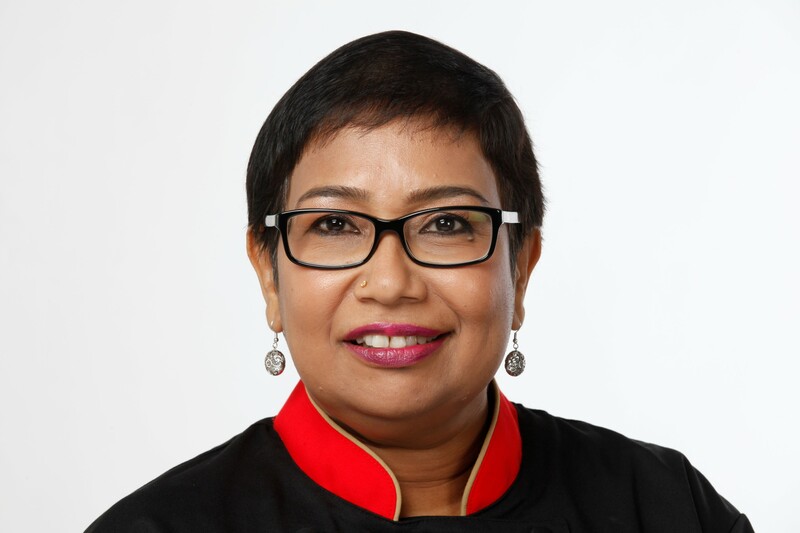 Over the years, I have eaten more and more briyani from all over the place – from coffee shops, restaurants, small hawker stalls, at weddings and Indian and Malay functions in Singapore. I never seemed to be satisfied. I have eaten briyani in Tamil Nadu, Kerala, Maharashtra, Punjab, Malaysia, Australia, Dubai and London, from high end restaurants to neighbourhood eateries. I did not seem to be satisfied. I tried cooking several recipes from cookbooks written by many famous chefs, and some did meet my standard. In fact, everyone says that as a chef I make a good briyani! Something inside of me is still craving for the ultimate one. I am still confused as to what makes a good briyani! The South Indian briyani is spicy whereas the North Indian ones are overly fragrant. The briyani sold in Indian Muslim restaurants and stalls in Singapore are too fatty for me. There are also those where the meat is cooked separately and then mixed with rice. This is called `dum’ briyani. Some rice grains are short, while others are long. Once cooked, some are either too soft or soggy. Some taste like curried rice and some like fried rice, with a ladle of curry thrown in. Recently, I found the mother of all briyanis in Hyderabad! Believe me, I am not joking! When I first told a few friends of mine that I was visiting Hyderabad, instantly they retorted` so you will be trying out the Hyderabad briyani’. While in Hyderabad, I was told by almost everyone I met in Hyderabad, that I should go to Paradise Restaurant to taste the best briyani in India, and perhaps the whole world. I did exactly that one afternoon. Accompanied by Chef Sujatha Kesavan from Singapore, I went to the Paradise food court at Secunderabad. I saw photographs of famous personalities, who visited it in the past, decorating its walls. We were warmly welcomed by Chef Pankaj Gupta, the executive chef of the chain of Paradise restaurants and Mr. Chandrasekhar, the business consultant of Paradise restaurants. We were later joined by brothers Dr. Kazim Himathi and Mr. Ali Hemati. Ali Hemati is the Chairman of the Paradise restaurant chain. The Secunderabad branch started as a small canteen and café in a cinema in 1953 and has now grown into a large chain of restaurants, not only in Hyderabad but elsewhere too. Amazingly, it is still growing. `When in Hyderabad, visit Paradise restaurant’ is now a slogan. 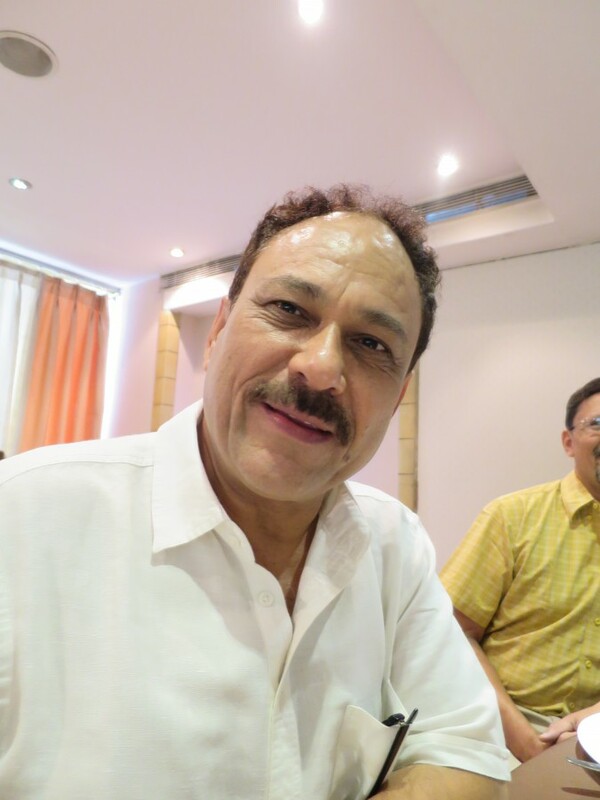 When Mr. Ali (born on the same day as the opening of the small café in 1953) took over the running of the restaurant in 1978, the café had already been transformed into a 100 seater restaurant, serving Hyderabadi cuisine, including its famous briyani. There was also a bakery in the same building. In 1983 Mr. Ali opened a multi-cuisine restaurant in the same building. Each of the four floors of the restaurant building offers a different ambience. 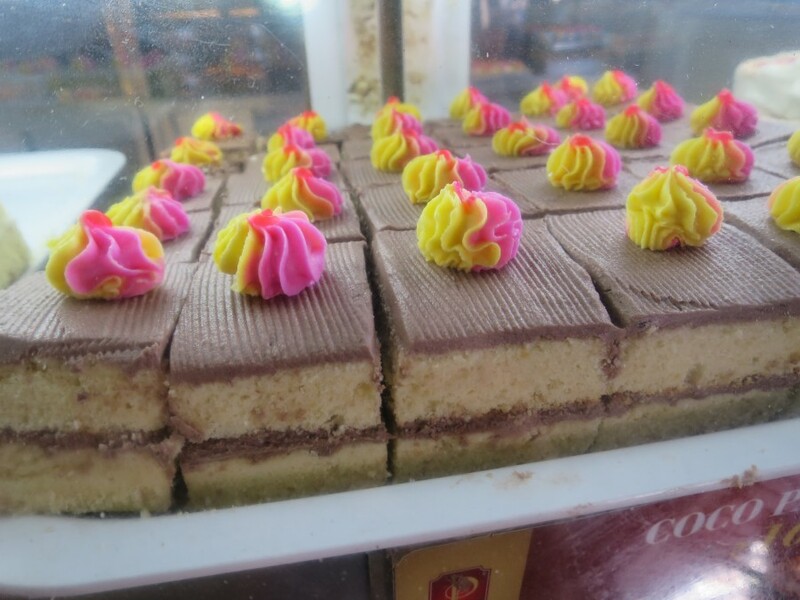 We were fascinated when we came to know that there is a bakery, a take-away counter, a multi cuisine food court and a Hyderabadi cuisine restaurant – all within the same building .There is also a valet parking service and a good security system which will screen guests before they step into the restaurant! Today, about one thousand four hundred customers patronize this restaurant at any one time, making it the largest sit-down restaurant in India. The restaurant’s front staff use PDAS that connect the kitchen for efficient and mistake- free service. The tagline of the restaurant is “Good food, Great service and Happy times” This is absolutely true as I can vouch for it. I saw people going in happily, in anticipation of a good meal, and coming out feeling completely satisfied. 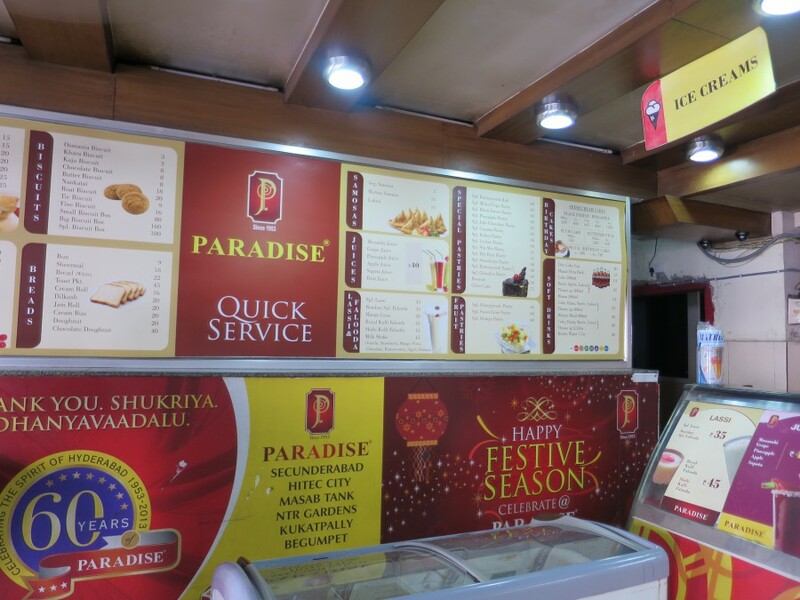 Paradise restaurant has over 1,700 employees in its service, working in its outlets in Hyderabad and serving up to 3,000 people at any one time. 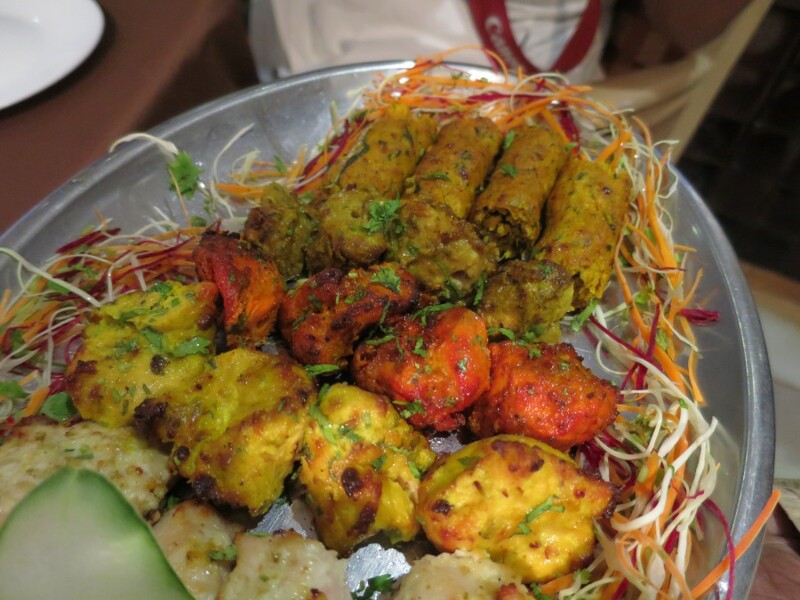 That afternoon, after the reception, we were served a platter of hot off the grill kebabs that were moist and tender with just the right touch of chaat masala. As I was savouring the kebabs, deep inside of me, I was waiting in anticipation for the star of the day to appear. It was certainly a worthwhile wait to taste the briyani that everyone craves about. 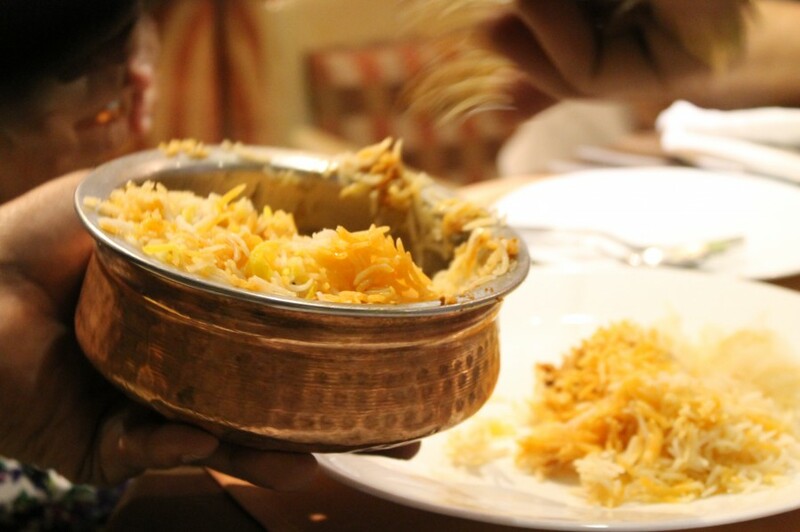 The Kachchi Gosht Briyani (mutton biryani) came in a rustic copper bowl filled to the brim. The waiter placed a dish of raita and one other dish, the mirchi ka salan, a hot and sour chilli condiment. He scooped up the saffron coloured rice, along with the small pieces of mutton from the pot, and gingerly placed it on my plate. The sensational aroma of the briyani hit my nose and my senses. Is this what briyani supposed to smell like? It is the smell of basmati, yoghurt, ginger, garlic, saffron, light smell of screw pine, saffron, fried onions, meat and spices – all combined together in that little pot and wrestling with each other to reach my nose. This briyani is a true blend of Telangana and Mughlai recipe, originating from the Nizams’ royal kitchen! The mutton was spicy, but looked so innocent that the masala that clung to the tender morsels of mutton was just about right in amount and moisture to tickle my palate. You don’t need a gravy to eat this briyani. Each and every grain of the rice was separate, firm and elegant, and yet cooked to the core. There is absolutely no oil. While the briyani is quite complete on its own, the mirchi ka salan is a good accompaniment to it. I had my fill. I told myself that if I ever feel like eating biryani, I would fly to Hyderabad and make my way to Paradise restaurant for the heavenly dish. Besides the chicken, mutton, egg and vegetarian briyani, there were many other items on the menu. With one glance, I saw a pot of briyani on every table! Mr. Ali suggested that I try the traditional desserts of Hyderabad. The D ouble ka Meetha is basically crispy pieces of bread soaked in saffron and cardamom flavoured milk, rabri. It was heavy with cream, ghee and sugar and had a light cardamom flavour. It was not exactly my favourite. I liked the Kubani ka Meetha – dried apricots compote. Some customers liked it with vanilla ice cream as a topping. After lunch, Chef Pankaj and Mr. Chandrasekhar took us on a tour of the kitchen. I was amazed at the size of the kitchen and the number of staff they had. The basmati rice was boiled in water and left to be cooked. When it was about 60% cooked, it was added to the marinated mutton pieces in several heavy cauldrons. The goats for the mutton were carefully picked as they should always be of the same weight and size. The basmati rice and ghee used to cook the mutton briyani were also of a special variety. 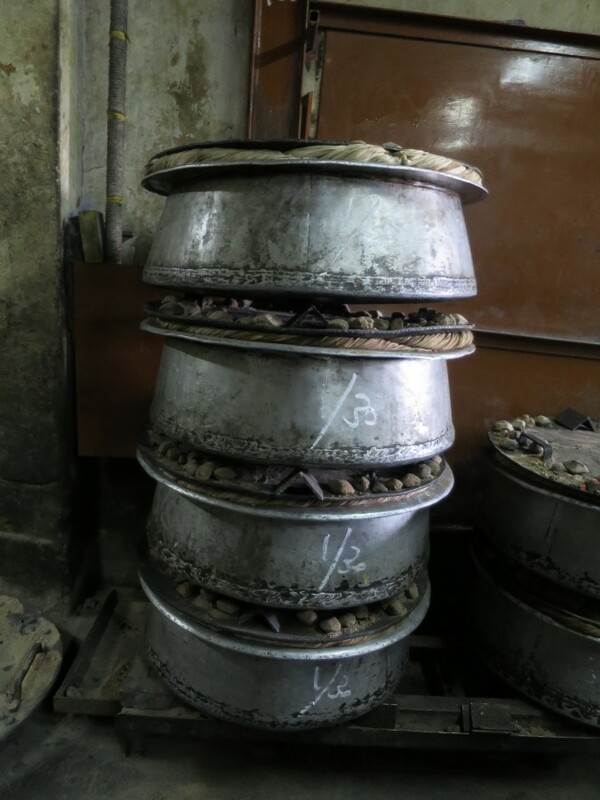 Mr. Ali and Chef Pankaj explained that in traditional “dum” cooking, the pot is covered with a wet cloth and topped with pot covers that are about 27 kg each. Glowing charcoal is placed on the cover and the briyani is left to cook on low heat for about 3 hours. 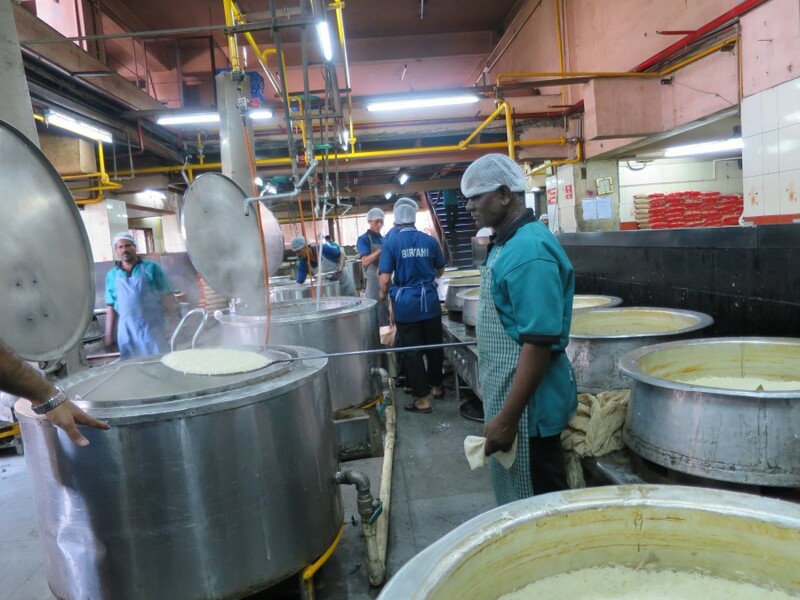 Quality ingredients and precise timing are a must for the making of Paradise restaurant’s briyani. I spent about 3 hours in the Paradise restaurant and left thereafter, knowing that the restaurant may one day open a branch in Singapore. I was wondering about quality control if there are many branches serving the same biryani. A couple of days later, when I was in Bangalore, I tasted the same briyani in one of its branches and realized that consistency and quality control is not a problem at all. The swanky Bangalore branch in Indira Nagar has a nice, café like ambience with glass exteriors, hanging lamps and contemporary interiors. This is certainly a far cry from the main branch in Hyderabad. The restaurant is spread over two levels. Staff are dressed in beautifully tailored uniform and are not only polite but also efficient. The taste of the briyani is the same as the ones sold in all the branches in Hyderabad. As the restaurant is still new, some of the items in the menu are still not available. Anyway, Paradise briyani is truly the best.